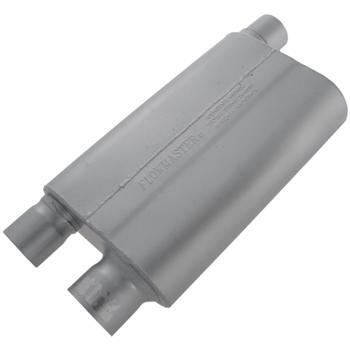 Flowmaster Performance Muffler - 80 Series Crossflow UNIVERSAL - MiataRoadster - Stay tuned with MiataRoadster! The 80 series is a cross-flow design for applications where the muffler is mounted transversely behind the rear end. Delivering an aggressive muscle car sound both inside and outside the vehicle, this is an excellent replacement for Camaros & Firebirds with transverse mufflers. Constructed of 16 gauge aluminized steel and fully MIG welded for maximum durability.